Second Life’s troubled concurrency figures appear to have finally stabilised, having been on an overall decline since March of 2009. 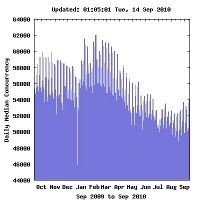 During the course of the last four weeks, median concurrency levels have finally showed some signs of rallying from their long route and appear to be relatively stable at levels that match the numbers we last saw in mid 2008 (around 54,000). It’s important to note that one point of concurrency doesn’t actually equal one user. Concurrency is the result of clustered logins (what you’d think of as ‘peak periods’), median session length, and total user numbers. More logins drives concurrency up, and so does longer online sessions. Assuming users are evenly spaced and online for one minute each, 1,440 users would mean a peak (and median) concurrency of just one. Despite popular belief, it isn’t really possible to determine what ratio concurrency has to total daily usage. You can make educated guesses if you have detailed data about the length of sessions, but that’s not really available. 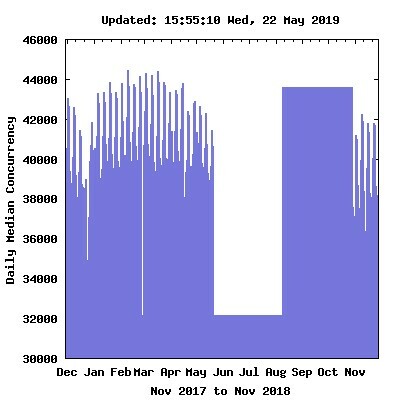 Nevertheless, it’s encouraging that the slide in usage that median concurrency represents seems to have halted for the moment, and may even be evincing the early stages of a climb. It bears watching, assuming Linden Lab doesn’t just go ahead and cut off the data-feed. Categories: Linden Lab / Linden Research Inc, Opinion, Second Life, Statistics, Virtual Environments/Virtual Worlds.